← 198 "The Trouble with Trillions"
The family is made into Spin-Art. "Girly Edition" is the twenty-first episode of season 9. It originally aired on April 19, 1998. The episode was written by Larry Doyle and directed by Mark Kirkland. "Bart attempts to upstage his sister when the pair land anchor seats on a Children's educational news program. Meanwhile, Homer exploits his elderly father to obtain a helper monkey, which he quickly puts to work looting donut shops." Krusty the Clown's show is coming under criticism by the FCC for not providing enough educational material for children, so Channel 6 decides to put a mini-series in to avoid further trouble. 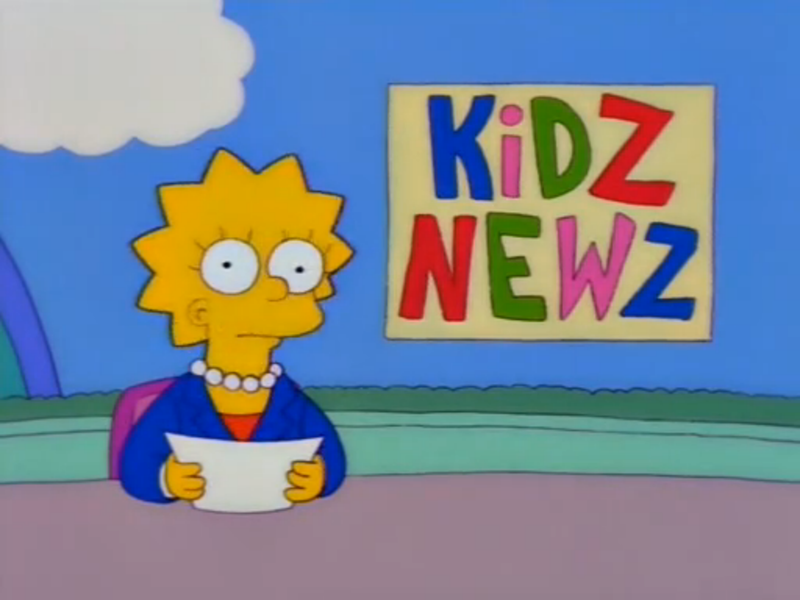 They decide to make it a children's news program and the producers look toward Springfield Elementary for staff. Meanwhile, Willie takes away Bart's skateboard for messing up the leaves he just raked and as revenge, Bart fills Willie's shack with creamed corn, destroying it, leaving Willie homeless. Lisa is chosen for head anchor and has to pick the rest of the staff. Marge forces her to make Bart part of the show. During the first show, Bart upstages Lisa with his over-the-top Sports report. Lindsey Naegle notices this and makes him co-anchor. Meanwhile, Homer goes to the Kwik-E-Mart to see that while Apu is healing from an injury, he has a helper monkey to run the store. Homer is perplexed by the idea and goes to buy one himself, calling it Mojo. However, the monkey becomes as big of a slob as Homer is and Homer has to give him back to the store when Mojo becomes overweight from overeating and lack of exercise. Bart overhears a conversation between Lisa and the producer where he hears her call him "dumb". To prove her wrong, he goes to Kent Brockman for advice to help him with his report. Kent shows him some of his emotional stories, inspiring Bart to create his own segment, "Bart's People", on the next show. Everyone who watches is touched, but Lisa sees through him and knows he's doesn't mean the words he says, so she tracks down Willie and tells him about a poor immigrant taking up refuge in the dump. When Bart does his live report, Willie attempts to kill him, but Lisa comes to save Bart. They see their feud will get them nowhere and the decide to retool the show to make it better, but it ends up cancelled and replaced with "Mattel and Mars Bar Quick-Energy Choc-o-bot Hour". Wikisimpsons has a collection of images related to "Girly Edition". Modified on November 23, 2016, at 19:56.